Lagos girls have embraced the use of second-hand fashion accessories including wigs and weaves to keep up with the current fashion trend, in view of the current economic meltdown. Some ladies resident in Lagos have embraced the use of second-hand fashion accessories including wigs and weaves to keep up with the current fashion trend, in view of the current economic meltdown. Those who spoke to the News Agency of Nigeria (NAN) on Friday in Lagos said that there was nothing wrong with the trend. Madam Gloria Madu, a trader said that since she could not afford to buy new hair extensions, she had to buy what her money could afford. Even Betty Irabor joined in oh LOL. “When I got to know that second-hand extension was available I went for it. “I need to look good and go about my business looking good, I don’t have to appear dirty, and people will pass by me without buying anything from me. “I need to be fashionable so that my husband will not be enticed by all these trendy young girls. “I attend meetings in the church and go for other outings, so I must dress well and do my hair, I have to fix my hair to look beautiful,”she said. She told NAN that hair extensions have gone up from N400 to N1, 000 and above. 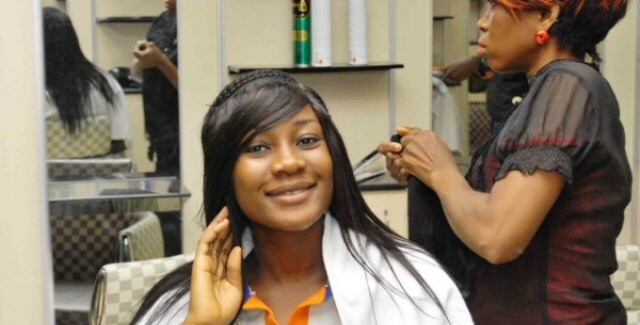 In the same vein, Ebele Chinonso a student of the University of Lagos, Akoka, said that since she could not afford a new “Brazilian hair’’ she had to go for the fairly used. “Most girls do buy second-hand Brazilian hair or any other one at that. We pretend a lot; while in actual fact we cannot afford them. “At least, you can get N10, 000 and above according to to your bargaining skills, because the new ones goes for N100, 000 and above,” she said. She added most of the weave-on that are being sold as fairly used, were used briefly by the previous owners and discarded. “Even some oyibos use it once and package it down here as second hand. Mrs Funmi Akpone, a business woman said that there was nothing bad in using second-hand items as long as it was washed very well before it can be used. “I discovered this by accident and it is cheaper for me. “As the prices of things are going up, we cannot look haggard so we have to look for alternatives. “I do not see the difference between those with new ones and the one I use; the most important thing is to look good. Most of the things we use in this country are second-hand things and it has benefited the poor masses a lot. “Am comfortable buying them,” ’’the business woman added. Meanwhile, Mrs Mary Ugodi a second-hand weave-on seller said that the sales have been on the high side because of the level of clientele. “I made good sells during the last festive period, there is no money in the country, so people do come and buy second hand one.